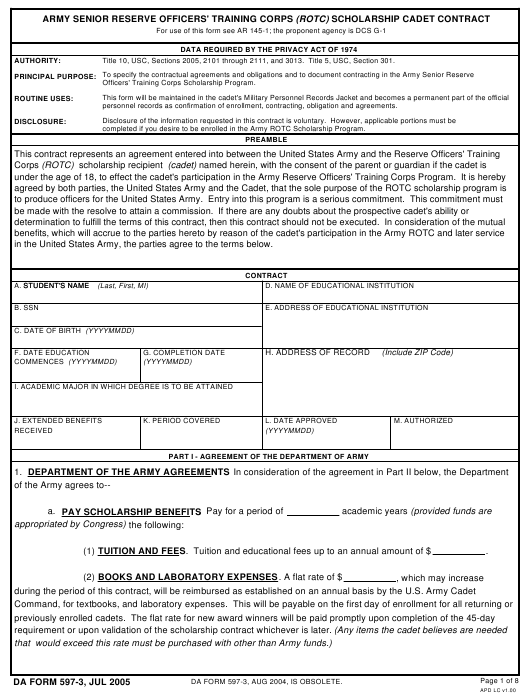 DA Form 597-3 - also known as the "Army Senior Reserve Officers' Training Corps (rotc) Scholarship Cadet Contract" - is a Military form issued and used by the United States Department of the Army. The form - often mistakenly referred to as the DD form 597-3 - was last revised on July 1, 2005. Download an up-to-date fillable PDF version of the DA 597-3 below or request a copy through the chain of command. Title 10, USC, Sections 2005, 2101 through 2111, and 3013. Title 5, USC, Section 301. Officers' Training Corps Scholarship Program. personnel records as confirmation of enrollment, contracting, obligation and agreements. completed if you desire to be enrolled in the Army ROTC Scholarship Program. in the United States Army, the parties agree to the terms below. DA FORM 597-3, AUG 2004, IS OBSOLETE. the first term of the academic year, he or she is immediately eligible for scholarship benefits payments. (2) 40 months for a 4-year scholarship. (3) 30 months for a 3-year scholarship. (4) 20 months for a 2-year scholarship. appointment as a scholarship cadet and to enlist in the USAR Control Group (ROTC)). d. PROVIDE TRAINING . Provide the cadet with U.S. Army-sponsored and -funded Reserve Officer Training. professional study is approved, until completion of the authorized delay. (ROTC)) for a period prescribed by the Secretary of the Army. Secretary of the Army or his/her designee, as a prerequisite for commissioning. approval from the Professor of Military Science (PMS). the minimum academic grade point average may subject me to disenrollment from the ROTC program. disenrollment from the ROTC program. f. MEDICAL AND PHYSICAL FITNESS STANDARDS. physical fitness requirements may subject me to disenrollment from the ROTC program. positive, I will be subject to disenrollment from the ROTC program. otherwise prescribe. If the result of the testing is confirmed positive, I will be disenrolled from the ROTC program. licensing examination for the second time, I will be branched based on the needs of the Army. Department of Defense Homosexual Conduct Policy as addressed in AR 600-20.
b. NATURE OF DUTIES AND CONSCIENTIOUS OBJECTOR STATUS. (senior year) if I am a one-year or less scholarship recipient. discharge without incurring an active duty or reimbursement obligation. not returned to active duty, I may be required to repay scholarship funds expended on my behalf. in paragraph 6 of this contract. concurrently with my contractual military service obligation under this contract. combat or exposure to nuclear, chemical, or biological weapons. eight-year contractual military service obligation has been served. of approximately two weeks until the remainder of my contractual military service obligation has been served. regulations to fulfill my contractual military service obligation. Army may seek recoupment against me. b. APPLICATION FOR RESERVE COMPONENT DUTY ASSIGNMENT. needs of the Army no earlier than 12 months before commissioning.